Hybrid Solar Wind Market size was over USD 700 million in 2015 with forecast of more than 8% from 2016 to 2024. Increasing demand for clean fuel off grid electricity will boost the demand for global hybrid solar wind systems in the near terms. As of 2015, over 1 billion people across the globe, i.e. 17% of world population, has no or poor access to reliable electricity. Strict government norms to reduce the greenhouse gas emission coupled with initiatives toward energy conservation will drive the hybrid solar wind market in future. Favorable initiatives to promote renewable energy will further compliment the industry growth. Financial support, tax rebate and other schemes to promote sustainable energy will drive hybrid solar wind market size growth during the forecast period. Government of India has announced a capital subsidy of one Lakh per kW to encourage the installation of wind–solar systems. These incentives are limited to community users including a minimum 10% of the annual budget allocations to be used for R& D purposes. Budget of fifty crores has been allocated under the scheme for the development of the sector. Decreasing solar and wind component cost coupled with increasing demand for clean fuel energy will further compliment the industry growth. The manufacturing costs of solar panels, wind turbine, wind blades, battery has witnessed a significant price drop since 2012 owing to technological advancement. 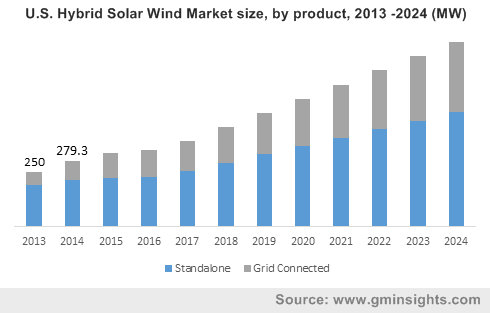 Standalone hybrid solar wind market size is likely to be reach over 2 GW by 2025 during forecast period owing to its cost effectiveness in remote area when compared with extension of grid connected power lines. Grid connected products were valued above 300 MW in 2015. In term of revenue, is likely to be worth at over 10% by 2024 period. Feed in tariff, net metering and low installation cost are some of the advantages of grid connected system over standalone. Residential end use applications are predicted to expand at the rate of over 14 % in future owing to electrification program in developing countries mainly focusing on decentralize generation. Commercial hybrid solar wind market size was valued above 367 MW in 2015.Increasing demand for uninterrupted power supply sector will drive this industry growth. Industrial hybrid solar wind market size was estimated over USD 224 million in 2015 and in term of revenue, is likely to be worth at over 13%. Government regulations to reduce carbon footprints will increase the adoption of hybrid systems in future. U.S. hybrid solar wind market size was valued at over 310 MW in 2015. Increasing emphasis on renewable energy, government incentives and measures toward energy conservation will favor the industry outlook. India hybrid solar wind market share is projected to witness substantial gains over 21% in term of Volume over forecast timeframe owing to the government initiatives to promote sustainable renewable energy resources. MNRE has proposed draft policy to install solar wind system of 10 GW by 2022 which will favor the industry growth. Low cost financing for hybrid solar wind project are also introduced by the financial institution and Indian Renewable Energy Development Agency. Nigeria is anticipated to witness a growth over 16%, in term of revenue by 2024. Increasing demand of electricity and large off grid population will propel the business growth over the forecast period. Financial incentives for the integration of establishment renewable energy station will help to drive Australia hybrid solar wind market in future. which include solar and wind farms. Arena has allocated a USD 9.9 Million grant to build a 10 MW solar plant along Gullen Range Wind Farm. These initiatives will help to reduce the construction cost of solar farm by 20% of the total cost. Major industry participants include ReGen Powertech, Blue Pacific Solar Product, Inc., UNITRON Energy System Pvt. Ltd, Alternate Energy Company, Polar Power, Inc, Alpha Windmills, Zenith Solar System, Gamesa, Supernova Technologies Private Limited, Grupo Dragon. Hybrid solar wind system is combination of windmill and solar energy panel. It also comprises of a battery, which is used to store the energy produced from both the sources. Thus, this system has increased reliability and improved efficiency as compared to the individual mode of generation. Increasing off grid electricity demand, growing concern regarding environment and depletion of fossil fuels, government initiatives is anticipated to be a key factor propelling the industry growth in future timeframe.